Like the latest celeb couple sighting or Starbucks Frapp to take social media by storm, new fashion trends seem to appear by the day. Sometimes they take us by surprise (remember the Zombie frapp?! ), and other times we totally see them coming (we shipped Miley and Liam from the start). The bottom line is, we’re here to listen either way (okay, now we’re talking fashion). Take notes, dolls; below are 5 style trends to keep in mind for Prom ’19. Embroidered, applique…we’ll take florals any way we can get ‘em! This trend stays fresh by popping up in a range of fun detailing. Not to mention, nothing greets Spring better than a floral prom dress. 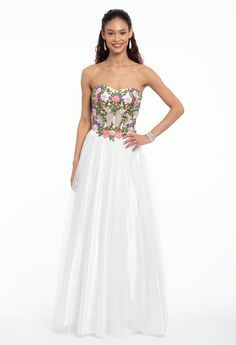 Try a pretty pastel ballgown with floral applique or embroidery for the formal night. Can you say pictures puh-lease? This prom, let it shine (and shine and shine) in a style that will literally light up the room! A metallic prom dress is a totally on-trend and unique for a memorable evening. Steal the spotlight in a mermaid, wrap, or off the shoulder prom dress. The Kira Kira app just met its bestie for the night. These satin prom dresses give a whole new meaning to “smooth dance moves.” This silky fabric has always been around for formal, and with the rise of 80’s fashion, it’s especially big for 2019. Ready to look regal? Discover plenty of satin and Mikado styles in the Camille La Vie collection, including this tiered, wrap, and high-low style. The 90’s called, and informed us that slip dresses aren’t going anywhere just yet. After recently making their way back into fashion, this slinky style favorite gradually transitioned from casual date night to black tie dress. Made for the minimalist, a simple slip serves as the perfect backdrop for a dazzling clutch and jewels. Want style that’s a leg up? Try a wrap dress for prom! Perfect if you can’t decide between a ballgown or a form-fitting silhouette, this flattering look meets in the middle and shows off just the right amount of skin (hellooo red carpet-worthy leg slit!) Find tons of wrap dresses in this season’s collection, but for now, start with these elegant open-back styles. Now that you’re armed with the trends, get out there and shop! Browse the entire prom dress collection here.